ST. CYRIACUS was a holy deacon at Rome, under the popes Marcellinus and Marcellus. In the persecution of Diocletian, in 303, he was crowned with a glorious martyrdom in that city. With him suffered also Largus and Smaragdus, and twenty others, among whom are named Crescentianus, Sergius, Secondus, Alban, Victorianus, Faustinus, Felix, Sylvanus, and four women, Memmia, Juliana, Cyriacides, and Donata. Their bodies were first buried near the place of their execution on the Salarian way; but were soon after translated into a farm of the devout lady Lucina, on the Ostian road, on this eighth day of August, as is recorded in the ancient Liberian Calendar, and others. To honour the martyrs and duly celebrate their festivals, we must learn their spirit, and study to imitate them according to the circumstances of our state. We must, like them, resist evil unto blood, must subdue our passions, suffer afflictions with patience, and bear with others without murmuring or complaining. Many practise voluntary austerities cheerfully, only because they are of their own choice. But true patience requires, in the first place, that we bear all afflictions and contradictions from whatever quarter they come; and in this consists true virtue. Though we pray for heaven our prayers will not avail, unless we make use of the means which God sends to bring us thither. The cross is the ladder by which we must ascend. St. Cyriacus is invoked for diseases of the eye, and against diabolical possessions. O God, Who dost gladden us with the solemn yearly festival of Thy holy martyrs, Cyriacus, Largus, and Smaragdus, mercifully grant that we may imitate the virtue of their martyrdom whose feast day we now celebrate. Through our Lord Jesus Christ, Thy Son, Who liveth and reigneth with Thee in the unity of the Holy Ghost, God, Forever and ever. From all perils of soul and body defend us, O Lord, we beseech thee, and by the intercession of blessed and glorious ever Virgin Mary, Mother of God, of blessed Joseph, of thy blessed apostles Peter and Paul, and of blessed N. and all the Saints, graciously grant us safety and peace that all adversities and errors being overcome, thy Church may serve thee in security and freedom. Through our Lord Jesus Christ, Thy Son, Who liveth and reigneth with Thee in the unity of the Holy Ghost, God, Forever and ever. Graciously hear, O Lord, the prayers of Thy Church that, having overcome all adversity and every error, she may serve Thee in security and freedom. Through Jesus Christ, thy Son our Lord, Who liveth and reigneth with thee, in the unity of the Holy Ghost, ever one God, world without end. Lesson from the Epistle of Blessed Paul the Apostle to the Thessalonians. Brethren, We give thanks to God without ceasing, because that when you had received of us the word of the hearing of God, you received it not as the word of men, but (as, it is indeed) the word of God, Who worketh in you that have believed. For you, brethren, are become followers of the churches of God which are in Judea, in Christ Jesus; for you also have suffered the same things from your own country­men, even as they have from the Jews, who both killed the Lord Jesus and the prophets, and have persecuted us, and please not God, and are adversaries to all men; prohibiting us to speak to the gentiles that they may be saved, to fill up their sins always: for the wrath of God is come upon them to the end. Fear the Lord, all ye His saints: for there is no want to them that fear Him. V. But they that seek the Lord shall not be deprived of any good. Alleluia, alleluia. V. (Wisdom 3: 7) The just shall shine, and shall run to and fro like sparks among the reeds forever. Alleluia. Be glad in the Lord, and rejoice, ye just: and glory all ye right of heart. 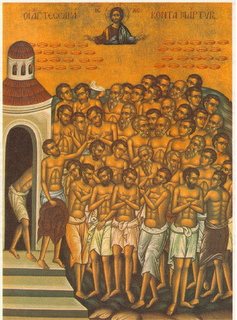 O God, Who dost gladden us with the solemn yearly festival of Thy holy martyrs, Cyriacus, Largus, and Smaragdus, mercifully grant that we may imitate the virtue of their martyrdom whose feast-day we now celebrate. Through our Lord Jesus Christ Thy Son our Lord, Who liveth and reigneth with Thee in the unity of the Holy Ghost, one God Forever and ever. Hear us, O God, our salvation that through the power of this Sacrament Thou mayest defend us from all enemies of soul and body and bestow upon us grace here and glory hereafter. Through our Lord Jesus Christ Thy Son our Lord, Who liveth and reigneth with Thee in the unity of the Holy Ghost, one God Forever and ever. Protect us, O Lord, who assist at Thy mysteries, that, cleaving to things divine, we may serve Thee both in body and in mind. Through Jesus Christ, thy Son our Lord, Who liveth and reigneth with thee, in the unity of the Holy Ghost, ever one God, world without end. And these signs shall follow them that believe in Me: they shall cast out devils: they shall lay their hands upon the sick, and they shall recover. Refreshed by partaking of Thy sacred gift, we beseech Thee, O Lord, our God, that, by the intercession of Thy holy martyrs, Cyriacus, Largus, and Smaragdus, we may experience the effect of that to which we pay our worship. Through the Lord Jesus Christ, Thy Son, Who liveth and reigneth with Thee in the unity of the Holy Ghost, one God For ever and ever. May the offering of this divine Sacrament cleanse and protect us, O Lord we beseech thee, and by the intercession of the Blessed Virgin Mary, Mother of God, of blessed Joseph, of thy blessed Apostles Peter and Paul, and of blessed N. and all the Saints, may it purify us from all sin, and free us from all adversity. Through the Lord Jesus Christ, Thy Son, Who liveth and reigneth with Thee in the unity of the Holy Ghost, one God For ever and ever. O Lord our God, we pray Thee that Thou suffer not to succumb to human hazards those whom Thou hast been pleased to make sharers of divine mysteries. Through Jesus Christ, thy Son our Lord, Who liveth and reigneth with thee, in the unity of the Holy Ghost, ever one God, world without end.